The steel framework for phase one of City of Wolverhampton’s new railway station building is close to completion. Contractors Galliford Try finished laying the foundations in February, following the demolition of the former British Transport Police building, and a small section of the current station building next to Platform 1. Once the remaining tonnes of steel framework are installed, work will begin on lifting in floor slabs, laying the block work for the external walls, cladding the building and putting the roof on to make it watertight. It is all part of delivering a £150 million transport hub to provide an attractive commercial gateway to those entering the city by national rail, bus or tram. As there will be no changes to the platform areas as part of the scheme, this has allowed it to be cleverly designed in two phases to ensure train services from City of Wolverhampton continue to operate as normal throughout. The first section of the new station building is expected to become operational to customers in autumn 2019, when phase 2 of the programme – bringing down the remainder of the current station building and completing the new build – will also start. The new state-of-the-art railway station building to serve the city will be fully open in summer 2020. Wolverhampton Interchange Partnership consists of City of Wolverhampton Council (CWC), Ion, West Midlands Combined Authority (WMCA), West Midlands Trains, Virgin Trains, Network Rail, Midland Metro Alliance, Canal & River Trust, and Black Country LEP. 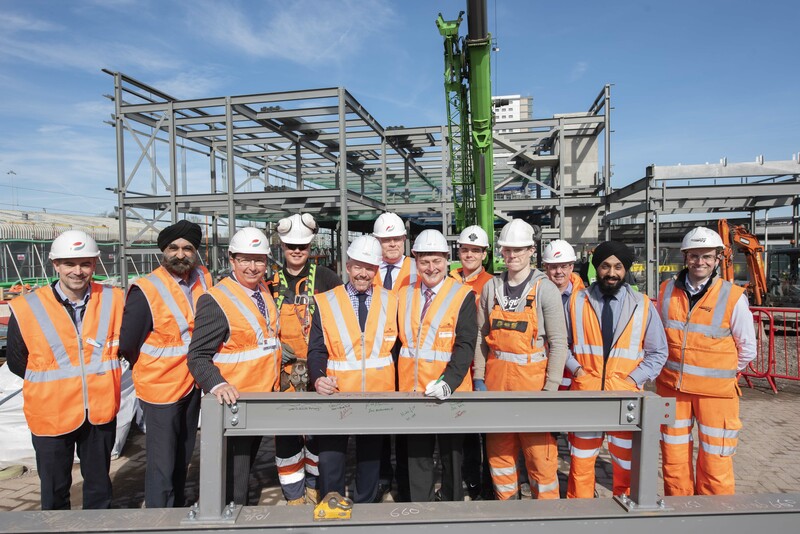 Councillor John Reynolds, Cabinet Member for City Economy, said: “The steel framework of the new Railway Station building is already sitting proudly on the city’s skyline and these are exciting times for regeneration in the City of Wolverhampton. “There is more than £3.7 billion of investment on site or in the pipeline across the city, and the railway station development is a big part of how we are re-imagining and re-inventing our city centre. Malcolm Holmes, director of rail at Transport for West Midlands (TfWM), which is part of the West Midlands Combined Authority (WMCA), added: “Seeing the steel work go up is a symbol of the on-going regeneration of Wolverhampton which is clearly a city on the up. Francis Thomas, head of corporate affairs for West Midlands Railway, said: “Rail travel has never been more popular, with passenger numbers continuing to rise across the West Midlands. Wolverhampton’s new station and interchange will be a significant part of catering for this continued growth, with improved connectivity between different modes of public transport in the city. Once work on the new station building is completed it will pave the way for the Midland Metro Alliance to begin the final link of the new city centre tram extension. The Midland Metro Alliance is currently delivering the Pipers Row and Railway Drive phases of the extension to the railway station.